The weather's hot and this cool dessert is just as hot and sultry. 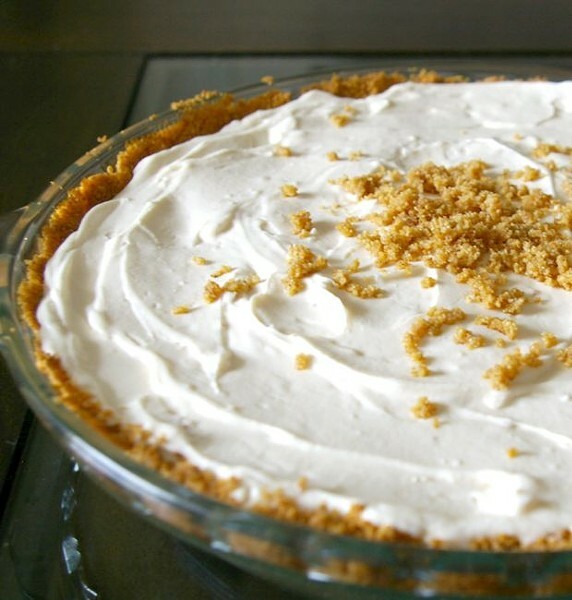 This version of banana cream pie has a spicy kick as well as a nip of alcohol. Hints of curry flavor mingle in the sweet graham cracker crust and the cream of the pie is spiked with rum. Thin slices of ripe banana are layered in the cream too. I found this recipe on epicurious.com, and adapted it to my liking. The curry flavor is subtle and works well with the other flavors of the pie. Don't expect the results to be your typical run of the mill, vanilla boxed pudding and whipped cream type of pie here ... this one is much, much better. Stir together crumbs, butter, curry powder, cinnamon, and 2 tablespoons brown sugar in a bowl with a fork until combined well. Reserve 1 tablespoon crumb mixture for garnish and press remaining crumb mixture evenly onto bottom and up side of pie plate. Bake crust 10 minutes, then cool completely in pie plate on a rack, about 20 minutes. Beat together cream cheese, zest, and remaining 6 tablespoons brown sugar in a bowl with an electric mixer at high speed until light and fluffy, about 1 minute. Beat cream with rum in another bowl with cleaned beaters at medium speed until it holds soft peaks. Gently stir one third of whipped cream into cream cheese mixture to lighten, then fold in remaining whipped cream gently but thoroughly.